You've seen Shields' commercials. Your doctor or insurance company has reminded you of it. 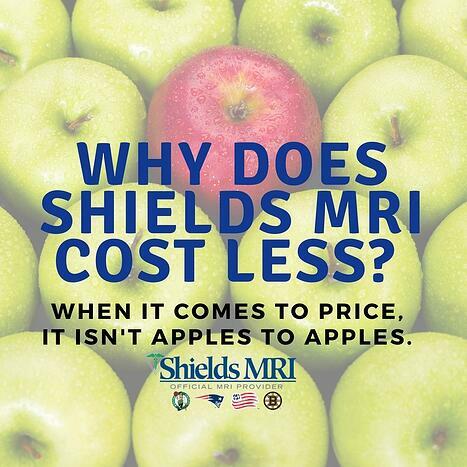 So you get it - choosing Shields MRI can save you money! But why?? How can an MRI that is of the highest-quality cost up to 60% less than hospitals? Since we get this question a lot from patients, businesses and health care providers, we're clarifying the answer for everyone. Basically, it is Shields' specialty focus imaging that allows us to offer the best technology, service and price. Unlike a hospital which offers multiple service line with high overhead costs, Shields' laser focus on imaging means more efficiency, and that translates into savings for our patients. As a specialty outpatient provider, the price of an MRI at Shields is low - especially when compared to higher-cost teaching hospitals. Patients can see savings of up to 60% - or even more - for the same exact MRI technology. Think of Shields MRI as the experts in MRI - we do one thing (imaging) and we do it exceptionally well. Infact, are so specialized in our imaging that other hospitals offering the same services will seek out our radiologists and technologists. Our efficiency model is spread across our network and the savings are too. You should feel great about your choice to have an MRI at Shields, and we encourage you to compare our value to other providers. There are some questions you should ask all providers as you look around for an MRI, and Shields has created a comparison chart for you. Feel free to download it and print for use as you shop around. We also offer an online price tool that lets you know the EXACT out of pocket cost that you'll pay, customized to your exam and your insurance. We are the ONLY imaging provider in the Northeast to offer this unique program to our patients. Check out our price calculator for yourself here.